elemeni anti-aging radiance face oil featuring the finest precious Bulgarian rose otto (essential oil) formulated in an intensive healing treatment for environmental damage, fine lines and wrinkles, rosacea and scarring. 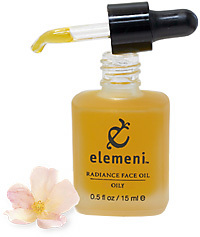 Elemeni Radiance Face Oil Oily Prone Complexion Formula (over 82% organic content) is a synergistic blend of exquisite pure organic oils that can help rebalance and revitalize maturing complexions and restore dewey radiance. The secret is the astringent carrier oils partnered with rare Rosa Moschata oil from the Andes Mountains known for its high content of essential fatty acids—oleic, linoleic, and linolenic—all important for healthy skin. Amazingly light and non-greasy, our Pure Plant Origin formula is free of petrochemicals so it magically absorbs to balance and nourish your skin without leaving oily residue. The hazelnut oil and cypress essential oil are mildly astringent and the jojoba oil is non-comedogenic which makes this formulation ideal for men's complexions. It can be safetly applied to the delicate skin around the eyes. Use in the morning and before bedtime - the aroma from the rose, cypress and mandarin is calming. Apply one drop to clean fingertip and gently massage into face, neck and around the eyes. Use more if needed. If oil is not absorbed after a few moments use less next time. For external use only. Do not use if sensitive to any of the ingredients. Avoid contact with eyes. Olea Europaea* (Olive) Oil, Rosa Moschata* (Rose Hip) Seed Oil, Simmindsia Chinensis* (Jojoba), Corylus Avellana (Hazelnut) Oil, Daucus Carota (Carrot) Oil, Tocopherol (Natural Vitamin E), Cupressus Sempervirens (Cypress), Rosa Damascena (Bulgarian Rose Otto), Lavandula Angustifolia* (Lavender), Citrus Nobilis* (Mandarin), Santalum Album^ (Sandalwood), Boswelia Carterii (Frankincense), Calendula Officinalis* (Calendula), Ascorbyl Palmitate (Vitamin C Ester).